I read this article and found it very interesting, thought it might be something for you. 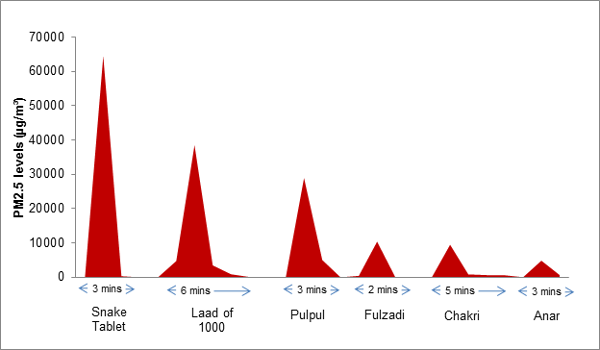 The article is called Smoke From Firecracker Snake = 464 Cigarettes (And Other Diwali Stories) and is located at https://archive.indiaspend.com/cover-story/smoke-from-firecracker-snake-464-cigarettes-and-other-diwali-stories-53583. 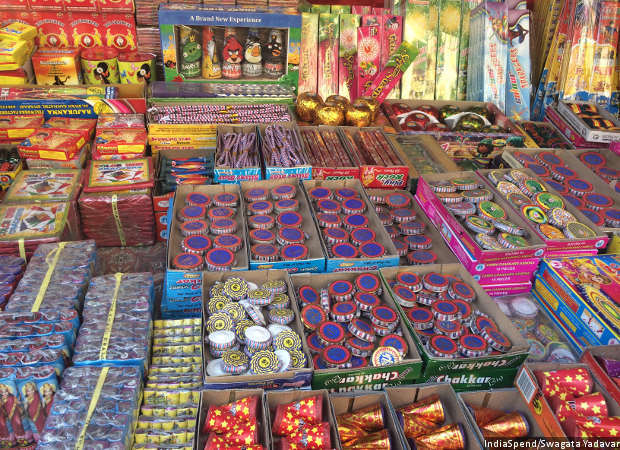 Six popular firecrackers–the snake tablet, the laad (string of 1,000 crackers), fuljhadi (sparkler), the pul-pul (string sparkler), anar (flower-pot), chakri (spinning firecracker)–emit particulate matter 200 to 2,000 times the safe limits as designated by the World Health Organization (WHO), according to this 2016 study by the Chest Research Foundation, Pune, and students from the Interdisciplinary School of Health Sciences of the University of Pune. IndiaSpend analysed the study results and compared them to the PM 2.5 emitted by a single cigarette in a closed room of 50 m³, as this 2014 study published in medical journal Tumori did, to get the equivalent of cigarettes inhaled. Mean PM 2.5 emitted by a typical cigarette in a room of 50 m³ is around 139 µg/m³. Although the snake tablet burnt for only nine seconds, it produced the highest peak of PM 2.5 (64,500 mcg/m3)–the equivalent of smoke from 464 cigarettes–while the laad, which burnt for 48 seconds, produced high PM 2.5 levels of 38,540 µg/m³, equivalent to particulate matter emitted by 277 cigarettes. PM 2.5, 30 times finer than a human hair, is even more dangerous due to its tiny size and ability to accumulate in human organs and blood. Children with weak immune and respiratory responses are particularly vulnerable. “Children, in particular, burn the fuljhhadi, the pul-pul and the snake tablet barely a foot or two away from them, and in doing so, (they) inhale a large number of smoke particles that reach deep into their lung,” Sneha Limaye, senior scientist at the Chest Research Foundation, told IndiaSpend. 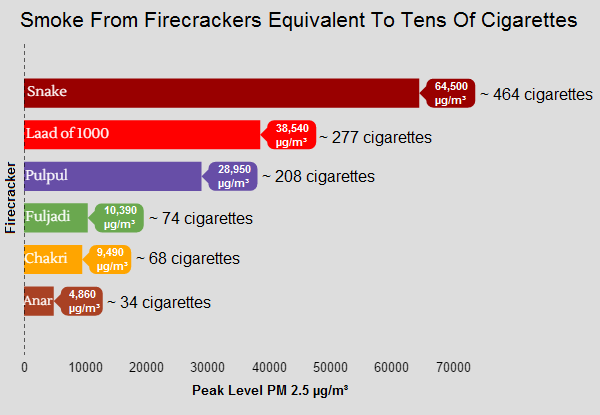 Firecrackers not only release particulate matter but also other harmful gases, such as nitrogen dioxide and sulphur dioxide. This 2014 study found that air pollutants were two to six times higher during Diwali than on normal days.